kitchen aid | A wife, a baby, a mortgage, and a startup. A wife, a baby, a mortgage, and a startup. Tom Monaghan likes to writes about startups, life, and other things. Can you count to four thousand, five hundred and thirty-six? My four year old is fascinated by numbers. He regularly poses questions like the following: “Dad, what’s 40 + 40 + 40 + 3 + 0 + 1?” I love how he tosses in the zero as a curveball. He’s a funny kid. Like the little guy, I too love to count. Always have. I’ve counted pretty much everything. Letters on road signs as I drive? Check. Bonus points for all the letters and digits on license plates in between those road signs? Achievement unlocked. The ceiling tiles in my thermo class in college? Definitely. Cards at blackjack tables in Vegas, New Jersey, Indiana, Southern Cal, and Aruba? Ding! So when I finally cleaned off my glasses two years ago March and realized I’d gone from being a rail for the first half of my life to the width of the old-growth forest stumps that yielded the sleepers over the second half, it’s no surprise that I turned to counting for my solution. So I started scanning bar codes and figuring out meals. Data. Counting. Awesome. And amazingly this overpriced iPhone did more fo my health than any gym membership I’ve ever had. So, it’s been nearly two years and after a brief respit from counting and caring about my fattitude this past fall, I’m back at it. Counting like the good ol’ days of license plates and doubling on a nine. Oh, and I bought an ice cream maker attachment for our stand mixer. I’m just full of good ideas. 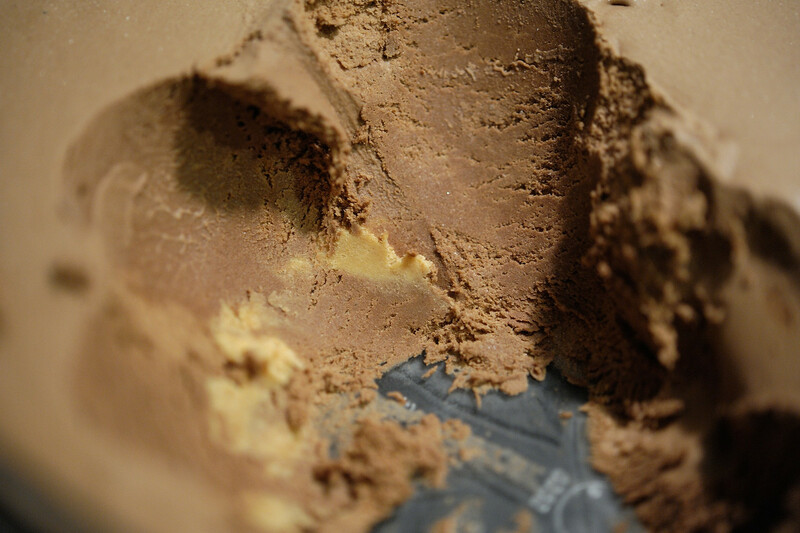 Let’s get dirty with some home made ice cream counting with tonight’s recipe, a variation of the ridiculous Philadelphia Chocolate with peanut butter from David Lebovitz’s amazing The Perfect Scoop. And the total for these three pints of awesome? Four thousand, five hundred and thirty-six calories of awesome. Oh yeah. But, it’s just 189 calories per 1/2 cup serving. And it’s got calcium in it. Yeah. Calcium. This entry was posted in data, food and tagged counting calories, ice cream, kitchen aid, MyFitnessPal on January 7, 2013 by Tom.